Just picked up my first Superhawk, a long time dream of mine. Been looking since about 2007, decided to pull the trigger when this one found me. All stock parts came with the bike also, seat, pipes etc. She was a one owner with just over 21k on the clock, far cleaner than any other SH available, not a spot on even the motor. I have put about 500 miles on her so far, only issue is a warm idle "hunt" of about 200-300 rpm. Feeling that a TPS calibration and taking the carbs back to stock, along with throwing the K&N in the trash would be what you guys would recommend. Congrats ! Very nice looking bike. Welcome to the club True. 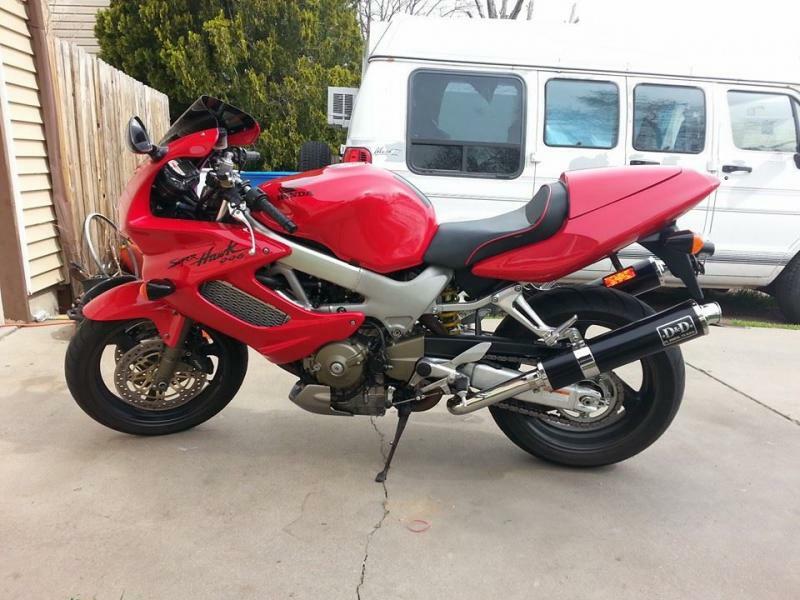 I too lusted over the VTR for several years before the right one landed about 2-3 miles from my house for sale. So clean! I wish my bike was in as good of shape when I bought it! Thanks guys, those are just crappy cell phone pics, i will get some better pictures this week. 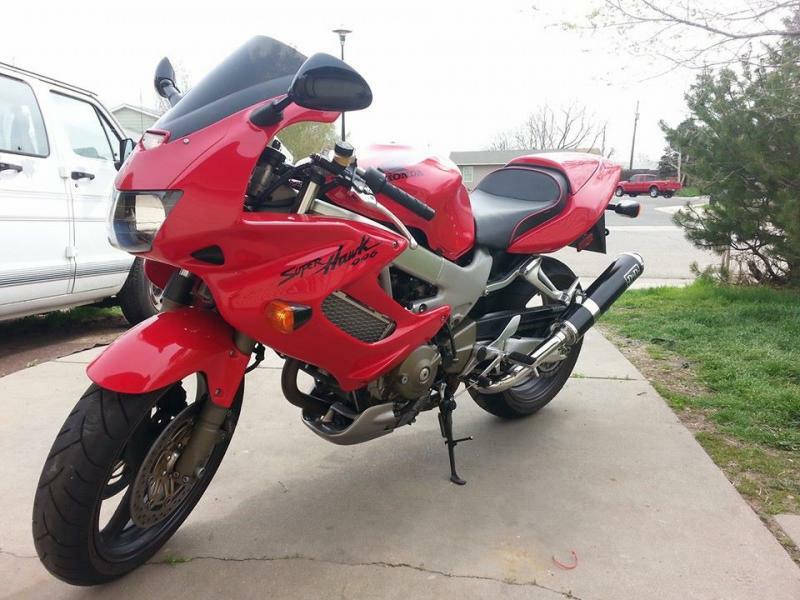 Best part about this bike, the guy did not seem to be a sport bike rider type, i doubt this bike knew what redline was until she was in my hands. Pipes aren't even discolored like some of the comparables that were available locally. I will admit that I paid more than book, and honestly more than i had intended on for this bike, didn't quite pay dealer price, but really close. Was just so clean when i went to look at it, had to make her mine. I see stock CCT's. Might want to put manual CCT's on there or do the "Stopper Mod". EDIT: Also, if you still have the stock R/R, you will want to look into a MOSFET unit. CCT's & stock R/R. Those are the two major items that go bad on the Superhawk. Last edited by CruxGNZ; 05-02-2014 at 05:54 PM. I paid a couple hundred below the KBB...but I'm paying the price for it. 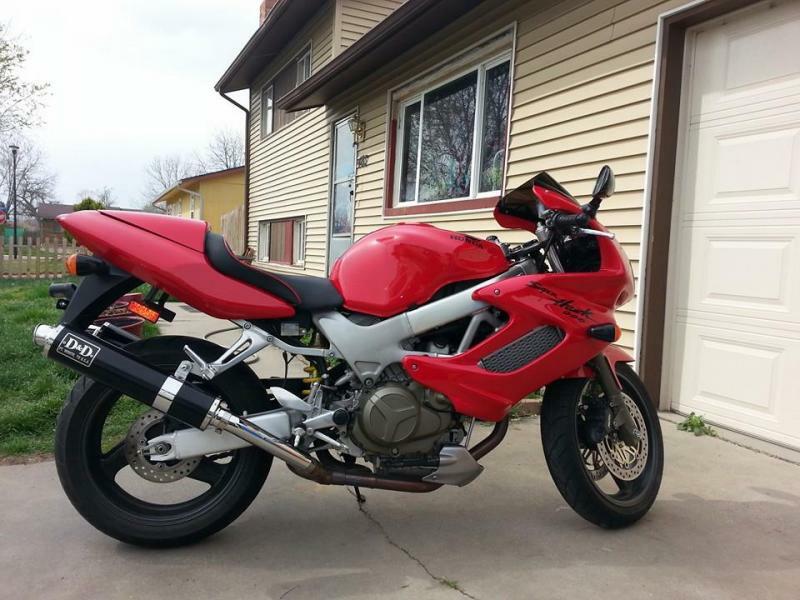 The bike was dropped...a lot of paint blemishes...and I'm having to replace the chain, tires, cush drive, air filter, spark plugs...so I'm not paying more than the book haha...oh well. I'll take care of her like she should have been taken care of originally. Wow.. that is one clean-looking hawk! Nice. However, and I'm surprised nobody else pointed this out, I wouldn't say it's a high miles specimen. That looks so familiar! What is that from? 21K is nothing; with care this engine will do well over 100K. It's better to pay a little more for a fine bike than get a ratty beast cheap! and it's in the fastest color too! I believe with the exception of the listed mods this bike is completely stock, I have a pretty complete maintenance history, no indication of any issues other than a warm idle issue, went to the shop for everything. Never been one to take anything to the shop myself, all upgrades, maintenance and repairs will be made by me from here on out. Is the R/R common enough of an issue to replace it prior to it being a problem? I wouldn't be thrilled getting stranded, but since it would not per se do any damage if it went out, i may hold off on this, if not a big likelyhood for a bike of this age/mileage. I do however feel that i really need to get some Mcct's ordered soon, i have not been very gentle with her so far, last thing i want to do is trash a head and piston. I am finally getting rid of some of the chicken strips the previous owner left on for 3,000 miles. The R/R can do damage if it goes bad. Melted connector at the R/R, cooked battery, or burnt windings on the stator, and a lot of seemingly unrelated gremlins affecting the way the engine runs as the R/R is going bad.